A train carrying crude oil derailed in Lynchburg, Virginia Wednesday afternoon, city officials said, the latest in a series of fiery accidents involving the transportation of the dirty fuel by rail. The City of Lynchburg reported "extensive flames and smoke" at the downtown scene involving as many as 14 CSX tanker cars. The train was traveling from Chicago to Virginia, according to CSX, when the derailment occurred at approximately 2:30 PM. The immediate area was evacuated, and Reuters reports that some of the cars spilled oil into the James River, which flows through town. 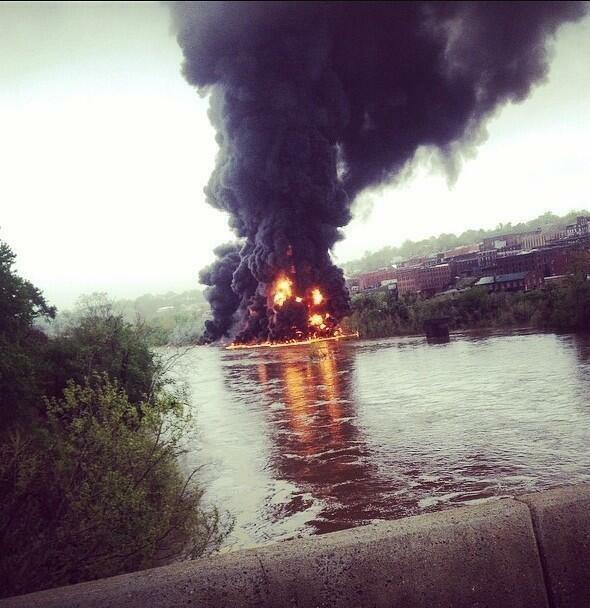 A photo posted by local ABC affiliate WSET shows three of the tanker cars in the river. Though it relies on the river for its drinking source, the city issued an update via Twitter that the city's drinking water was not impacted. Eyewitness Mason Basten told the Roanoke Times he saw "a big ball of fire." “The whole riverbank and the whole riverbed was on fire basically from the derailment just to about 100 yards before Blackwater Trail,” he added, saying the substance on top of the river water "sounded like a super-size deep fryer just going at it." Reports say they were going 24 mph. NTSB has not found any mechanical or human error. And all this from only 1-2 tanker cars worth of oil as reports suggest half of the crude oil from breached tanker cars spilled into the river. I can’t imagine the train was moving all that fast, although I haven’t read any reports. Picture downtown Albany along the Hudson and now imagine not 1-2 cars worth of oil, but 100 – 200 tanker cars worth. There are easily 2 unit trains worth of oil sitting down along the Hudson River and Rt 787 on any given day.